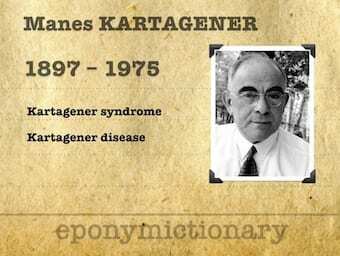 Manes Kartagener (1897 – 1975) was an Austrian-Swiss physician. First to report the triad of situs inversus, chronic sinusitis and bronchiectasis in 1933 – Kartagener syndrome. Wilhelm Löffler (1887 – 1972) was a Swiss physician. 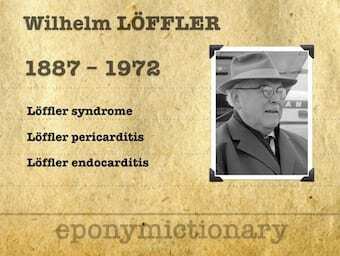 Löffler is eponymously associated with two clinical manifestations of eosinophilia which he described: transient pulmonary infiltrates with eosinophilia (Löffler syndrome, 1932) and endocarditis parietalis fibroplastica (Löffler endocarditis, 1936).